"The Promavica has two sensors that can capture 760,000 pixels. Photographer John Schaer of Cable News Network used such a camera to take the photo of a flower-carrying Chinese student facing down a tank in Beijing's Tiananmen Square during the 1989 rebellion. 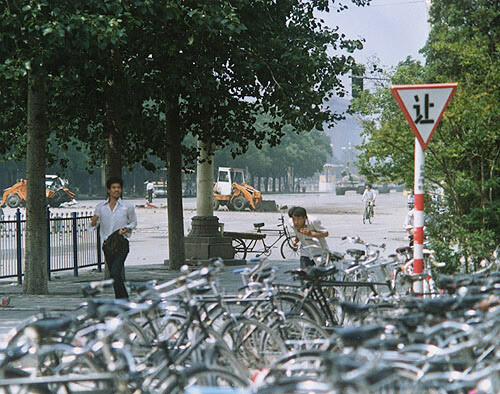 Schaer was able to elude China's blockade of news photographs by transmitting the shot by telephone." But surely Schaer, a television photographer, would have captured video, not stills? It didn't make much sense for CNN - a TV network - to bring a still video camera to Beijing, did it? Not in 1989, anyway. (Remember, this was before the world wide web). "I was using my normal Sony BVU 330 camera at the time. We used the first generation sony still transmitter to get the first images out of China. The actual video was given to a tourist at the airport to hand to a CNN Producer in Hong Kong." Schaer didn't specify the model, but I believe Sony only had one such transmitter at the time. According to several sources, the transmitter was a Sony DIH 2000 Digital Image Handler, a device which captured single frame images from any video source, motion or still video camera. The DIH 2000 Digital Image Handler is often mentioned along with the MVC-5000 still video camera, which may lead some people to believe that the two were always used together. But they weren't. In addition to Schaer's video, the scene was captured by at least four still photographers: Charlie Cole (for Newsweek magazine), Stuart Franklin (for Time magazine), Jeff Wiedner (for Associated Press) and Arthur Tsang Hin Wah of Reuters. 20 years later, a new and completely different photo turned up. 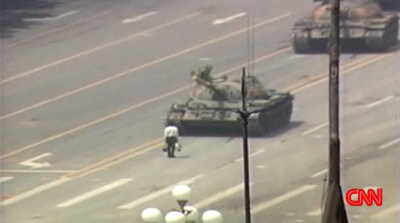 Terril Jones captured the tank man from eye level, moments before the tanks stopped in front of him. The photo was first published by New York Times in June 2009. A few days after first publishing this article, I came in contact with Terril Jones. Regarding the above quote from the 1991 CNN article, Terril says: "For us at the AP, there was never any blockade of news photographs at that time. Photos continued to be transmitted as usual, by telephone from the bureau." What really happened was that the Chinese government ordered CNN to stop their live satellite transmission from Beijing, despite the fact that the network was granted exactly one week's permission, timed to coincide with the historic visit of Soviet leader Mikhail Gorbachev. Anyway, when the satellite transmission was stopped, CNN transmitted their photo using phone lines, like AP and other news agencies. Terril Jones' fascinating capture was taken with a Nikon F801 - an autofocus camera, using an 80-200mm manual focus Nikkor lens.